DEAR MAYO CLINIC: I recently tore my brachial plexus as a result of a motorcycle accident. I can’t move my right shoulder and arm much, and they hurt a lot. I have an appointment to talk with a surgeon about it. But I’m wondering how this kind of injury usually is treated. Is surgery really necessary? ANSWER: Brachial plexus injuries involve damage to the network of nerves that sends signals from your spinal cord to your shoulder, arm and hand. These injuries often cause weakness or paralysis, as well as numbness in the hand, arm or shoulder, and they can be very painful. The goal of treatment for a brachial plexus injury is to restore as much function as possible. When the injuries are minor, surgery may not be needed. But in a case like yours, where the brachial plexus is torn, surgery often is required. Your brachial plexus includes five major nerves that originate at your spinal cord and travel down through your shoulder to your arm and hand. Those nerves control all the sensation and motor function in your entire arm. Brachial plexus injuries usually occur when your head and neck go one direction and your shoulder is forced in the opposite direction. Less severe forms of this injury can happen during contact sports, such as football and wrestling. More severe injuries to the brachial plexus often happen due to trauma sustained during high-speed motor vehicle crashes. Symptoms depend on the severity of a brachial plexus injury. They may include a burning sensation down the arm, weakness, numbness and inability to use certain muscles. 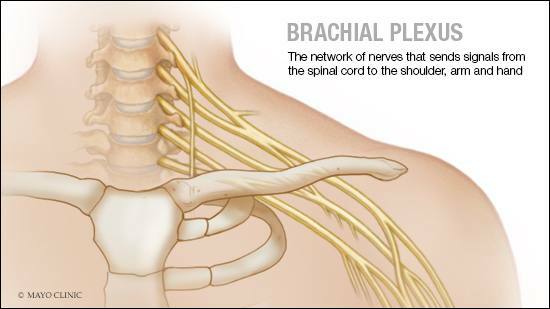 If a brachial plexus nerve is pulled out of the spinal cord at its root — a condition known as avulsion — it can lead to a complete inability to move or feel anything in the arm, shoulder or hand controlled by that nerve. Many brachial plexus injuries also cause moderate to severe pain. Fixing an injured brachial plexus involves repairing the nerve damage. The way that’s done depends on the type of injury you have. If a brachial plexus nerve is compressed or slightly stretched, it may not need treatment. But physical therapy may be appropriate to keep joints from becoming stiff while the nerve heals. When the nerves stretch to the point that some of the nerve fibers come apart, a nerve tears into separate pieces, or the nerve is pulled from the spinal cord, then surgery is necessary to repair the damage. If a brachial plexus nerve is damaged somewhere other than its root, the surgery involves removing the damaged portion and replacing it with a section of a nerve taken from another part of your body. This is called nerve grafting. When a nerve is completely ripped from the spinal cord and no nerve fibers remain behind, there is no way at this time to surgically repair the damage. But treatment is available to help restore function. That may involve transferring functioning but less important nerves to the injured nerves that have a more important function. This type of surgery is called a nerve transfer. A more complex procedure entails moving a muscle from your leg to your injured arm using microsurgery to potentially restore more function. It’s generally recommended that brachial plexus surgery takes place within about six months from the time of the injury. Surgeries that occur after that typically have lower success rates.